What does it take to succeed at Amazon as a Christian? A group of friends and I compared the Scriptures with Amazon’s Leadership Principles to find out. (For more thoughts on leadership read Why Captain America Leads the Avengers.). We started with customer obsession because it was the first on the list and because it really is the central principle at Amazon. To be earth’s most customer centric company. What does customer obsession look like? We gave various examples like AWS refunding customers who had passed the trial period without realizing it. What are the limits of customer obsession? 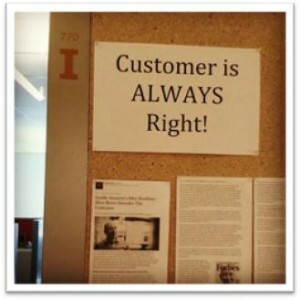 Can the customer ever be wrong? We debated giving customers what they want versus what they need. One example is the scandal when a book on pedophilia was self-published and after some back and forth Amazon ended up choosing to listen to the customers who were offended by it. Our discussion concluded that it’s about doing what’s right for customers. What are some relevant Scriptures? We can’t always take what customers say at face value, but we can commit to loving our customers and doing what is right for them. I don’t remember the second passage, but the essence of our discussion was about how Christians represent the Lord in their actions and likewise represent Amazon in their deeds. What happens when we lose customer obsession? We tend to become profit-obsessed. In this way, customer obsession is one way we fulfill God’s command to love our neighbor as ourselves and protects us from the perils of worshiping money. What about sellers and employees? Are customers benefitted at the expense of our vendors, sellers and employees? When Amazon uses its leverage to negotiate better terms for customers, the vendors still have a choice to make. As long as Amazon maintains integrity and does not fudge metrics to get better terms or withhold money that rightfully belongs to the vendors, using its scale to deliver more value to customers seems just and fair. What would earth’s most God-centered company look like? Please leave a comment and read the next post on Ownership, Invent and Simplify. Back around 2009 or so, we recall the release of the Wii and PS3. -The think that has often made Nintendo successful (particularly with 1st party games, and not without heavy criticism to their hardware) is their Customer Centered thinking. Games are meant to be fun. -Opposing this at the time was the arrogance of Sony honestly thinking that “Oh, gamers want the best, and they’ll pay anything for it”. This, in my opinion, was a loss of understanding customer wants, and focused on making lots of money. We all know how that ended back then. Great example! How do you think the Xbox fits into this picture? I think there is a natural tendency to coast on success and turn inward, which has to be vigilantly reversed by continually working backwards from customers. I’ve noticed a correlation in my work where increasing my interactions with customers increases my creativity and clarity while long dry spells devoid of customer interaction demotivate me and muddle priorities. Not totally sure I agree cronin. You make a good point, but first off I don’t think Sony was selfish and profit hungry primarily. They simply appealed to different segment of the market. Most Sony customers I know, myself included are very satisfied with the PS3, and are intensely loyal. Yes they charged a lot of money, but at the time the price of the new technologies they employed was very high. Nintendo gambled on a different segment of the market, appealing to families, younger gamers, and the casual gamers. Knowing they could not compete in hardware, they innovated in a different market segment. Both companies did what was right for their target market and both were very successful in the long term because of it. I would consider both companies relatively customer neutral though in the context of this article. They do whats right for the customer so far as it is good for business but both companies seem to have pretty standard policies in terms of handling customer disputes, standing by their work etc. Let me know if you disagree with my assessment because I am more then happy to discuss it. I am not a christian and tomorrow is my interview at Amazon. Can I make use of your resources? Sorry I didn’t get around to replying to your post until now. Hope your interview went well and absolutely you may use it!